Niagara Health patient Craig Millar says being able to provide feedback is vital in healthcare. 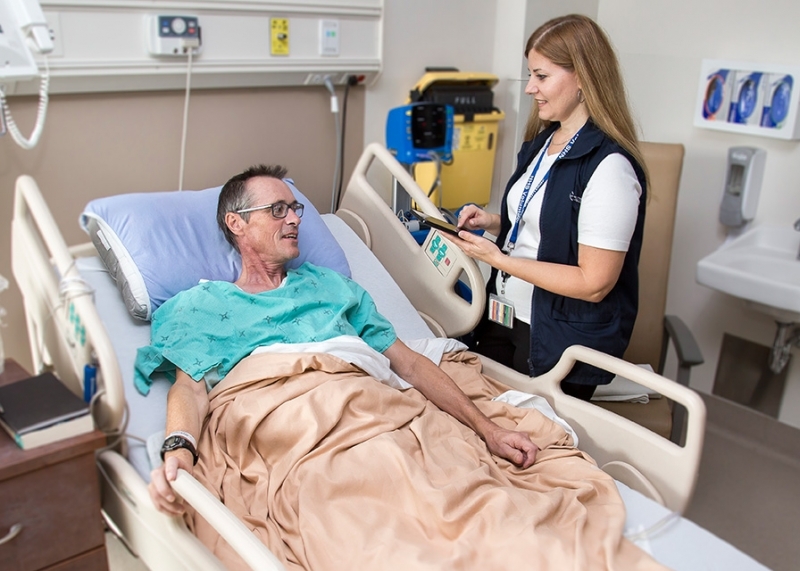 That’s why Mr. Millar welcomed the opportunity to participate in our new and innovative Patient Satisfaction Survey that sees trained volunteers visit patients in their rooms using a hand-held tablet to complete the questionnaire. 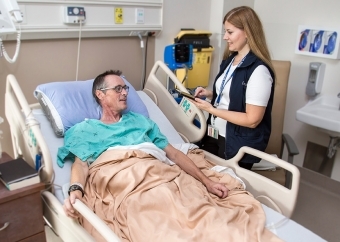 This technology, developed by Niagara Health’s Information and Communications Technology team, allows us to measure patient satisfaction in real time and includes an escalation process for timely resolution of their concerns. The volunteers ask patients five questions covering areas such as whether a doctor or nurse explained their care in a way they can understand, the involvement they had in decisions about their care and how they would rate the care they received. Any need not being met triggers an automatic email, using Connexall technology, signalling to the Clinical Manager of the unit that there is a patient concern that needs to be addressed. Lisa Hildebrand, Manager, Clinical Services at Niagara Health, says the survey has been an important addition for patient engagement. Being able to collect and act upon “in-the-moment feedback” can make all the difference in the experience of our patients and creates new learning opportunities for both staff and leaders. The Patient Satisfaction Survey, which is in addition to the regular discussions our healthcare teams are having with patients about their care, has been a rewarding experience for Niagara Health Volunteer Chantelle Sterenberg. Mrs. Sterenber surveys patients at our St. Catharines Site once a week as part of her volunteer role. In addition to being asked five questions, patients can include other comments at the end of the survey. “They’re happy to have a way to thank an individual or the staff in general,” says Mrs. Sterenberg.